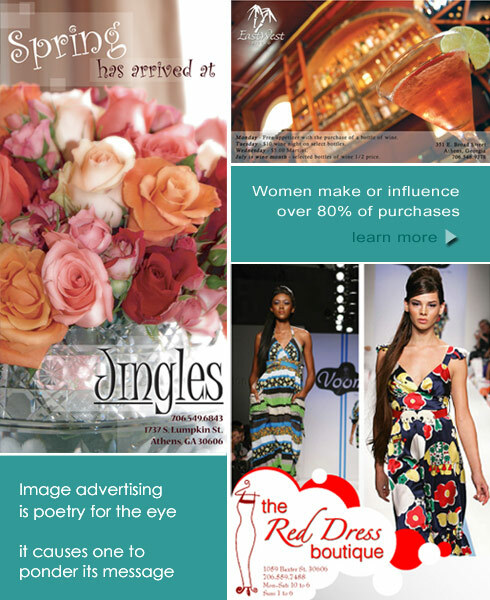 Athena is a quarterly, full glossy, large format (9 1/2" x 11 3/4") magazine for women. Athena is distributed in Athens, Georgia and surrounding counties. Athena ads are designed to attract the eye of readers while preserving a uniform and sophisticated look throughout the magazine. Beautiful page design and editorial images compliment and balance nicely with advertising images. Magazine ads utilize dramatic images and intentional "white space" to communicate the image of a business - rather than attempting to relay every detail in a text heavy format. Athena's oversized format provides the opportunity for significant visual impact.